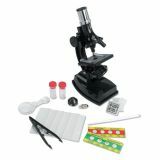 Young explorers can't wait to get their hands on this magnifying lens. Get a close-up view of insects, flowers and more with this heavy glass lens with plastic frame and large, easy-to-grip handle. 3x magnification. Get a close-up view of your world! 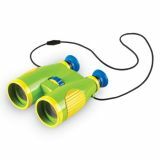 Colorful, simple-to-use binoculars featuring a focus knob, soft rubber eyepieces, 6x magnification, and breakaway lanyard are perfect for little explorers. Binoculars measure 5½"L x 5"H.
Adorable jars feature ladybug wings that open to invite little learners to investigate insects. 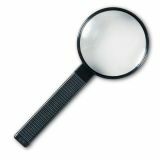 Supports scientific observations with a 3.5x magnifying lens, hidden under the bug's wings. 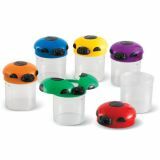 Durable plastic jars measure 4.5"H x 3.5"H in diameter. Get a close-up view of the world! The power of discovery is in your hands with this perfect first telescope featuring a focus knob, soft rubber eyepiece, and 20x magnification for easy viewing. Use the adjustable tripod or remove the telescope for on-the-go exploration. It's never too early to start exploring! 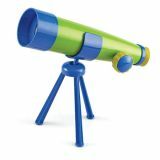 Telescope measures 10"L.
Everything from sporting events to nature walks take on new dimensions when kids get closer to the action. 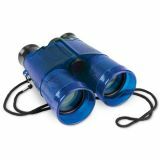 Durable, translucent plastic binoculars deliver a 6X magnification with 35mm diameter lens. Clip on strap allows hands-free carrying. Take a look! 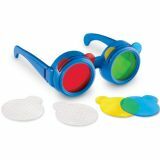 These unique child–size glasses and interchangeable lenses let students observe the world while learning about color. 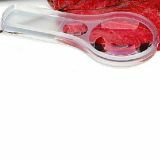 Features 8 easy-to-change lenses, 2 each of red, yellow, and blue distortion lenses that let you see the world like a bug. 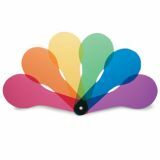 Transparent 6" paddles in six colors with three textures demonstrate the principles of color mixing. 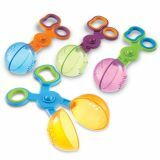 Ten versatile plastic magnifiers (1.75" diameter) featuring 3x and 6x magnifications. 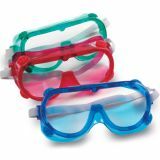 Encourage creative and visual thinking, illuminate sensory play and spotlight science exploration! 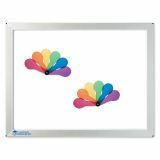 Investigate colors, light, textures, manipulatives, real-life objects, and more with this lightweight, portable light box. Features a large, backlit viewing surface and a low-voltage, long-life bulbs.